Don't send out an SOS for your next 80s-themed party! Send our Totally 80s Postcard! Printed on high quality card stock, this postcard features a background of awesome cassette tapes with bright, bold colors highlighting your event. 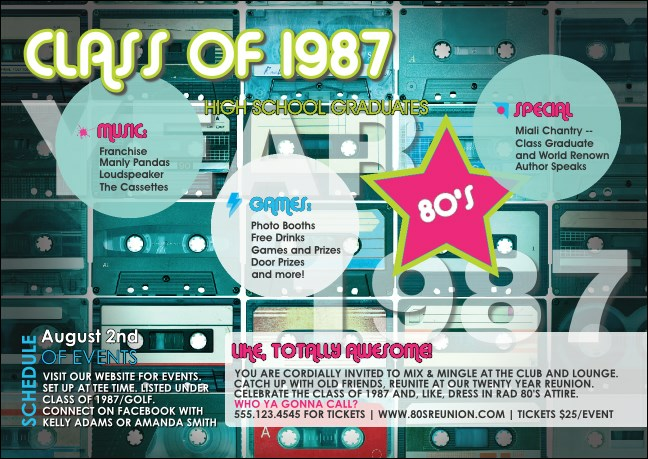 Perfect for your party if you graduated high school in '87, or if you were born in '87! TicketPrinting.com has all your posters, flyers, and tickets for your retro party.